In this unique book, the authors focus on big ideas—like patterns, transformation, movement, balance, and relationships—as a way to think about content, and they integrate science and mathematics through these big ideas, rather than linking them topically. 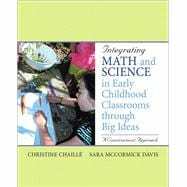 The book looks at why it is important to think about thinking, introduces assessment early to help the teacher plan for assessment before teaching even begins, and sets up an environment that will support the construction of the big ideas that integrate math and science. Real-life scenarios provide invaluable insights into the teacher’s thinking and planning, and each chapter includes two modules to be used for in-depth exploration of different aspects of the big ideas. It’s a unique exploration of thinking and learning. Christine Chaille is Professor and chair of the department of Curriculum and Instruction at Portland State University, focusing on early childhood education, where she has taught since 1991. Her doctorate is from U.C.L.A., and she also studied with Jean Piaget at the University of Geneva. She is the author of Constructivism Across the Early Childhood Curriculum: Big Ideas as Inspiration, and co-author, with Lory Britain, of The Young Child as Scientist: A Constructivist Approach to Early Childhood Science Education, has written many publications primarily on the importance of children’s play. She has also developed a child development curriculum for Hands to Hearts International that is used with caregivers in orphanages in Southern India, as well as in other countries and with other vulnerable populations. She was a panel member responsible for developing the NSTA Position statement on Early Childhood Science Education (2014). She has served as President of the Oregon Association for the education of Young Children, President of the National association of Early Childhood Teacher educators, and Chair of the early education/Child Development Special Interest Group of the American Educational Research Association, and is the recipient of the Outstanding Early Childhood Teacher Educator award for 2013 from the National Association of early Childhood Teacher Education. Sara McCormick Davis has degrees in Family Relations/Child Development and Early Childhood Education. Her doctorate is in Curriculum and Instruction from Oklahoma State University. She taught preschool through fifth grade for many years before working with teachers, both pre service and in service. As a preschool/elementary classroom teacher, one of her goals was to always have a project going in her classroom that helped children construct new ideas. Her interests and work have revolved around how teachers can integrate curriculum so that children are engaged and learning. She has published about the integration of the arts in teacher education and researched practices of classroom teachers as they work to create environments where everyone can flourish. Big Ideas, Projects, Concepts, Topics, and Facts: What Are the Differences? What Is Important About Patterns? Why Do We Talk About Patterns with Young Children? The Planning Process: What Does It Look Like?